When I have the Opportunity to Entertain my friends and family, I always prepare food that’s both playful and delicious. I want everyone to leave my house thinking, “Gosh, that meal was amazing—I don’t have to run home and immediately jump on the treadmill!” Therefore, I make a point to use omega-3-rich olive oil rather than vegetable oil for cooking, and protein-rich ingredients like quinoa and chickpeas for main courses. Portion control can be a challenge when surrounded by delicious food! 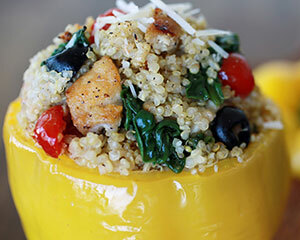 Therefore, I like to serve recipes like my chicken and quinoa stuffed peppers for the main course. They are gluten free, and you can easily eliminate the chicken by adding a heartier vegetable (think Portobello mushrooms) for your vegetarian friends. This recipe is easy to prepare, and the concept makes serving and portion control effortless in one colorful, neatly contained, mouthwatering package.